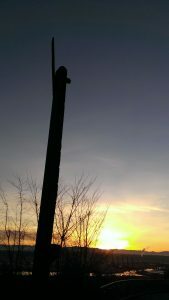 This spring I’ll share photos of Seattle public art, its location, and related links. 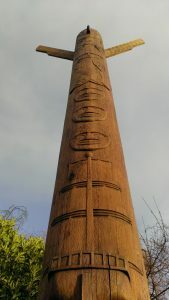 This contemporary carved pole stands at the Admiral Viewpoint in West Seattle. Artist Michael Halady tells the story of the welcome to Europeans extended by the Native Seattle dwellers. 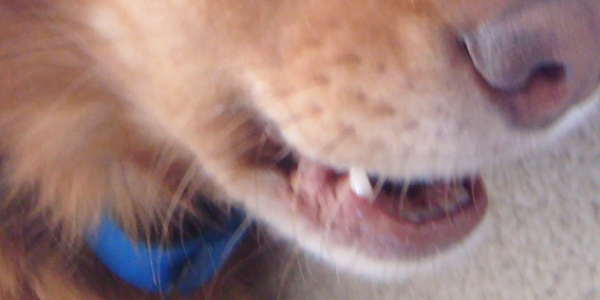 If I don’t say otherwise, all photos are mine. 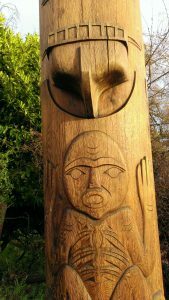 IF YOU CANNOT VISIT THIS CARVED POLE IN SEATTLE, FIND A PUBLIC ART WORK TRADITIONAL TO YOUR HOME. WHAT IS THE WORK? WHO MADE IT? WHAT IS IT MADE FROM? Previous Post Why Read MINDING THE MUSE, A Handbook for Painters, Composers, Writers, and Other Creators by Priscilla Long, if you have read The Artist’s Way by Julia Cameron, and such?